Of Anglo-Indian descent, Edward Salim Michael spent his entire childhood in various countries of the Middle East. He never had the opportunity of attending school and did not have a mother tongue. Parental peregrinations brought him back to London just before the storm of the Second World War. So, without knowing how to read or write and only understanding a few words of English he found himself drafted into the Royal Air Force as a simple airman on the ground staff. It was there that providentially he made the acquaintance of an Anglican Chaplain who taught him the basics of reading and writing. The Chaplain’s wife taught him music which he assimilated at a stunning speed. His first orchestral piece, composed after only two years of study, won a competition and was played at the Albert Hall in London. After the War, from which he emerged terribly bruised, he pursued his musical studies with passion and in addition to composition, became a solo violinist. He gave his first concerts after only three years of study. In 1949, another providential meeting awoke within him a mysterious silent memory. 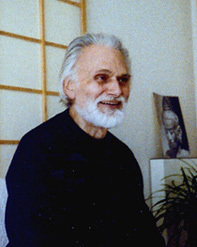 It was in London at the house of Mr. Adie who was part of the Gurdjieff groups in England, that he saw a statue of Buddha for the first time in his life. He remained transfixed in front of it and, when he returned to his home, he immediately put himself into the same posture as the statue with no difficulties, closed his eyes and began to concentrate on an inner sound that he heard within his ears and head, without even knowing that what he was doing was called meditation and the sound on which he was concentrating was known as the Nada in India and comprises a concentration aid known to both Hindus and Buddhists. In parallel to his career as a musician, he then embarked on his spiritual practice with all the passion and exactingness of a great artist. Through the exceptional concentration skills he had developed as a composer, he swiftly began to have profound spiritual experiences. As his parents had never practiced any religion, he had been sheltered from any religious conditioning. His lack of school education and book knowledge left him with a slate clean from prejudice and projections. He would follow the path of direct experience, beyond all dogmas. He lived from hand to mouth under the most precarious conditions, assiduously pursuing his practice of meditation added to by a constant combat to remain present to himself amid all the circumstances of his active life. The Nada was a very important support for him. He tried to hear this inner sound in his meditation as well as throughout the day. He observed the extreme difficulty there was in remaining vigilant and conscious of himself over the long term. So, he invented for his own use all sorts of concentration exercises which he would subsequently pass on to his students and in his books. Health problems obliged him to abandon his career as a solo violinist. He devoted himself solely to composition, struggling in the Parisian music scene to get his works performed. As his music (which he composed under his first name, Edward) remained tonal, he encountered ever greater difficulties in getting it performed. In 1968, he came to the decision to give up composition to go to India, the country of his maternal grandmother, with a view to dedicating himself fully to his inner life. Whilst there, he sought in vain a teacher to help him progress, but he did nevertheless have some meaningful encounters. A clairvoyant saint Indira Devi, warmly received him and recognized his spiritual achievement. As he regularly visited ashrams, Indira Devi impressed upon him that he should not waste his time looking for an outside teacher: he should pursue his own path. He would remain in India for nearly seven years during which he continued his practice of meditation with unshakeable tenacity as well as constant concentration in active life, finally succeeding in rendering his state of awakening permanent. Fascinated by Hatha Yoga, he started to practice it in Paris. In Poona, where he stayed for two years, he worked one to one with Iyengar for several months, then, when he went to live in Madras, he perfected his technique with the son of Krischnamacharia T.K.V. Desikachar. In both cases, it was only a question of technique for him; the science of asanas was certainly spectacular, but lacking in the concentration and presence to oneself which for him was the essence of spiritual practice. He would come to practice asanas and breathing control (Pranayama) three hours per day, to help his body, but above all with the aim of stabilizing a state of vigilance and pure presence, for which hatha yoga is only one means. Towards the end of his stay in India, he met several Tibetan teachers, including Nono Rimpoche with whom he was enthralled. The latter practiced Tibetan hatha yoga and asked him to join him in his monastery. Three months later, before the project took shape, the Tibetan teacher departed from this world. Edward Salim Michael was then impelled by apparently adverse circumstances to leave India. He went back to Paris and taught hatha yoga there to earn a living. Soon, his first students became more interested in his spiritual teaching than in hatha yoga alone. Despite his lack of scholastic education, at the request of the lady who would become his wife, Michèle Michael, he agreed to embark upon writing his first book with her help, which he wrote in English, The Way of Inner Vigilance, published in London in 1983, written under his middle name Salim. This book was republished in 2010 in the United States by Inner Tradition with a new title : The Law of Attention, Nada Yoga and the Way of Inner Vigilance. Over the course of following years, Edward Salim Michael would write seven others books directly into French. He taught until 2002 and departed from this world at the end of November, 2006.